It might sound a little silly to say, but the first great thing about the vinyl pressing of Anti-Flag‘s ninth studio album, American Spring, is the scale of the presentation. Before a note is heard, those who buy the vinyl will get an eyeful of the bright and beautiful album cover which looks like an artistic statement of blossoming artistry rather than appearing as though the image’s subject got shot in the face with a high-powered rifle at point blank range [which is what this writer assumed it was supposed to be when he first saw it while reviewing the CD]. There is a great balance between beauty and a commentary on the violence that the North American media inundates the population with, which is simply better to appreciate in a 12” x 12” print than it is on a smaller scale CD cover. Those who pick up the LP will find themselves admiring that image, and the first impression it leaves may indeed enhance the musical experience as much as the enhanced sound quality of the virgin vinyl pressing it’s associated with does. Having already gotten that eyeful, those who buy the vinyl will also get an earful when the needle sinks into their copy of the record (of which there are six color variants: black, pink and black split, light pink, hot pink, white and marbled gold). While the it may require a bit of equalizer tweaking to get the best play, listeners will find that, once again, virgin vinyl does trump a CD presentation’s play. The A-side surges with power as Anti-Flag pulls no punches and holds nothing back (there are classic Anti-Flag cuts here like the socio-pop punk anthem “Bradenburg Gate” as well as minute-and-a-half earbleeders like “The Great Divide”), but the best, most senses-shattering songs in the running are those which ring as more personal than political, like “Walk Away.” There, the band doesn’t speed and doesn’t scream its way through but does seethe methodically through its paces to ensure that listeners don’t miss a word or tone and have no choice but to absorb it all; and when they do that, they’ll find that lines like, “Walk away/ It’s what you always do/ Be the same/ As they want you to” and “The certainty of our lifetimes/ When we no longer dream, we die” ring as remarkably affecting. These are the moments which can’t be faked and shouldn’t be missed; they’ll hit listeners in the back of the knees and force them to feel it. To prove the point too, immediately after “Walk Away,” listeners are hit again with a similar sort of blow which follows hot on its heels (“Song For Your Enemy”) to ensure that, not only will listeners be baited to waste no time in flipping the vinyl when the A-side ends, they’ll also return to further examine the side later. Still riding hot from the close of American Spring‘s A-side, the B-side erupts with “All of The Poison, All of The Pain” and, again, blurs the lines between the political commentary on which Anti-Flag has built its career with more personal flavoring. The song throbs with fury as Justin Sane spits his whipped-to-a-froth vitriol and drummer Pat Thetic and guitarist Chris Head pour everything they have in them into their performances; the guitars run dangerously close to clipping from volume alone and Thetic washes the song in searing walls of cymbals. The assault is more unhinged and unchained than the band has allowed itself to be in years and, when energy bleeds into “Break Something,” listeners will know that nothing about it was calculated. These songs are reactionary and do not put any candy gloss on to help them slide along easily; listeners just have to confront them or back down passively. While “Without End” does break momentarily so the band can catch its collective breath (it’s the closest to a throwaway song listeners will find on this album), they’re right back in and blasting with “Believer” (a most acerbic “end of a relationship” song) and the molten “To Hell With Boredom” (which is, apparently, about a protest held in France in 1968 – but that means less than lines like “Drive the cop out of your head/ No one cares until you’re dead” do, in this context) to bring the energy back up to ‘uncontrollable’ levels and then hold it there for “Low Expectations” and “The Debate Is Over (If You Want It)” to run out the side. After the needle has lifted, listeners will find they’re absolutely stunned by what they’ve experienced on the American Spring LP. Both sides of the album hold more personal passion than Anti-Flag has ever allowed themselves to show before and listeners will find themselves absolutely adoring the performance, but also respecting the courage that it must have taken to make the record. 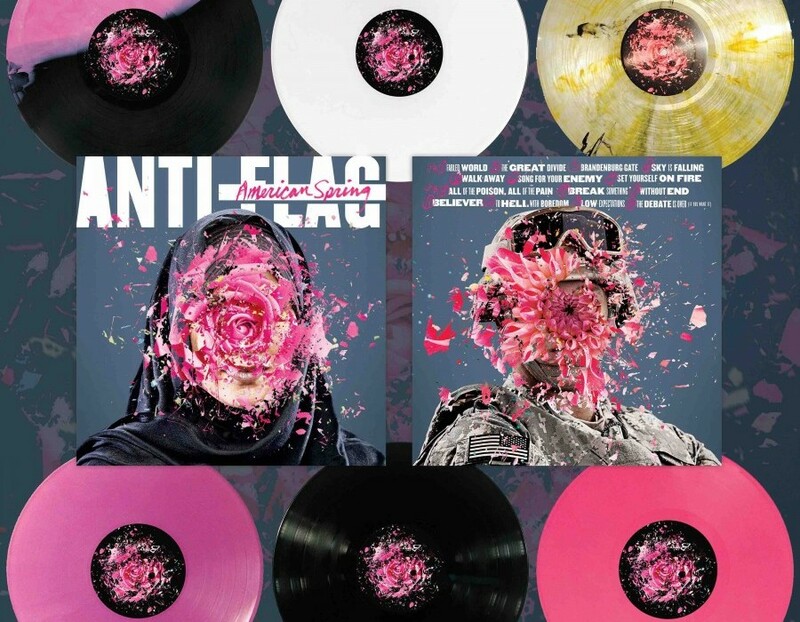 It’s for that reason American Spring stands out as a landmark album in Anti-Flag’s catalogue, and the vinyl pressing of it (complete with the larger-form artwork and liners as well as the analogue sound of vinyl) is absolutely, positively the best way to experience it. Holy Psychedelic Easter Sunday, Stonerman!